The sleek display uses precise Japanese quartz movement for accurate time keeping and a 1 year manufacturer warranty. Comes in a gold/silver tone stainless steel and connected with a Italian leather band 7.5" that uses a buckle clasp stay secured around your wrist. Colorful watch face design with easy-to-read analog dial. 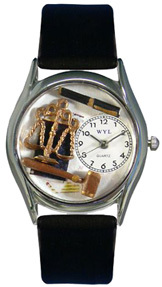 The timepiece is presented in a gift box. Hand-crafted in the USA. BUY NOW! 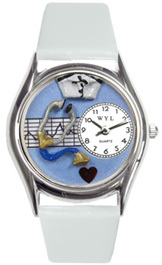 Watch Gold/Silver Style Nurse Blue UNISEX: If you can't find the right words to acknowledge your Nurse, let the Whimsical Nurse Watch speak it for you. It displays hand-crafted miniatures of a Stethoscope, Nurse Hat and pill bottles. The ideal way to express your gratitude for your Nurse. • GOLD Unisex Watch Case / WHITE (Skin) Watch Band: Watch case diamater is 1.5". #G-0620013. BUY NOW! • SILVER Unisex Watch Case / WHITE (Skin) Watch Band: Watch case diamater is 1.5". #U-0620013. BUY NOW! 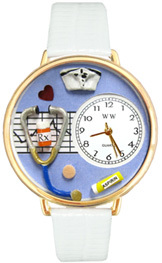 Watch Gold/Silver Style Nurse Blue CLASSIC: This is the smaller version of the Whimsical Nurse Watch. It features hand-crafted miniatures of a stethescope and Nurse hat. Makes a great Nurse appreciation gift. 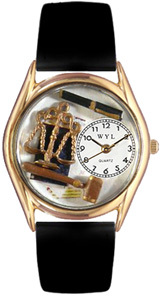 • GOLD Classic Watch Case / WHITE Watch Band: Watch case diamater is 1.25". #C-0610002. BUY NOW! • SILVER Classic Watch Case / WHITE Watch Band: Watch case diamater is 1.25". #S-0610002. BUY NOW! 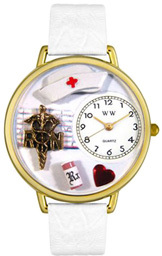 Watch Gold/Silver Style Nurse Angel UNISEX: If you can't find the right words to acknowledge your Nurse, let the Whimsical Nurse Angel Watch speak it for you. It displays hand-crafted miniatures of a Stethoscope, Nurse Hat and pill bottles. The ideal way to express your gratitude for your Nurse. • GOLD Unisex Watch Case / BABY BLUE (Padded) Watch Band: Watch case diamater is 1.5". #G-0620030. BUY NOW! • SILVER Unisex Watch Case / BABY BLUE (Padded)Watch Band: Watch case diamater is 1.5". #U-0620030. BUY NOW! 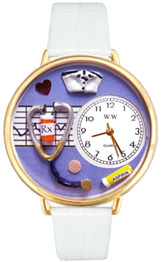 Watch Gold/Silver Style Nurse Purple UNISEX: If you can't find the right words to acknowledge your Nurse, let the Whimsical Nurse Watch speak it for you. It displays hand-crafted miniatures of a Stethoscope, Nurse Hat and pill bottles in a Purple Dial. The ideal way to express your gratitude for your Nurse. • GOLD Unisex Watch Case / WHITE (Skin)Watch Band: Watch case diamater is 1.5". #G-0620042. BUY NOW! • SILVER Unisex Watch Case / WHITE (Skin) Watch Band: Watch case diamater is 1.5". #U-0620042. BUY NOW! 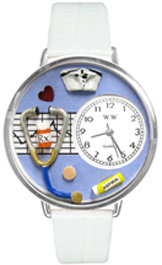 Watch Gold/Silver Style RN UNISEX: If you can't find the right words to acknowledge your Registered Nurse, let the Whimsical RN Watch speak it for you. Features hand-crafted miniatures of a Nurse Hat, medical symbol. The perfect way to show your appreciation for your RN. • GOLD Unisex Watch Case / WHITE (Skin)Watch Band: Watch case diamater is 1.5". #G-0620008. BUY NOW! • SILVER Unisex Watch Case / WHITE (Skin) Watch Band: Watch case diamater is 1.5". #U-0620008. BUY NOW! 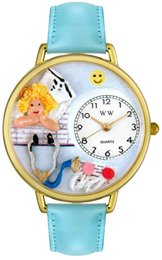 Watch Gold/Silver Style Doctor CLASSIC: This is the smaller version of the Whimsical Doctor Watch. It features hand-crafted miniatures of a stethoscope, pill bottle and examination light. Makes a remarkable Doctor appreciation gift. • GOLD Classic Watch Case / BLACK Watch Band: Watch case diamater is 1.25". #C-0610001. BUY NOW! • SILVER Classic Watch Case / BLACK Watch Band: Watch case diamater is 1.25". #S-0610001. BUY NOW! 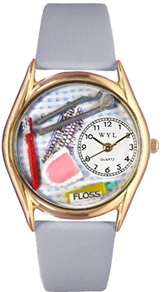 Watch Gold/Silver Style Dentist CLASSIC: This is the smaller version of the Whimsical Dentist Watch. It features hand-crafted miniatures of a dental tools, tooth paste and tooth brush. Makes a great Dentist or Dental Assistant appreciation gift. • GOLD Classic Watch Case / LIGHT BLUE Watch Band: Watch case diamater is 1.25". #C-0610004. BUY NOW! • SILVER Classic Watch Case / LIGHT BLUE Watch Band: Watch case diamater is 1.25". #S-0610004. BUY NOW! 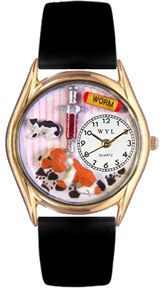 Watch Gold/Silver Style Veterinarian CLASSIC: This is the smaller version of the Whimsical Veterinarian Watch. Features hand-crafted miniatures of a cat, dog and syringe. 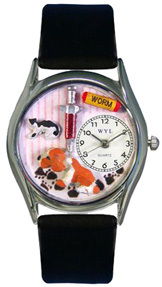 Makes a great Veterinarian appreciation gift. • GOLD Classic Watch Case / BLACK Watch Band: Watch case diamater is 1.25". #C-0130013. BUY NOW! • SILVER Classic Watch Case / BLACK Watch Band: Watch case diamater is 1.25". #S-0130013. BUY NOW! Watch Gold/Silver Style Lawyer Classic: If you can't find the right words to acknowledge your Lawyer, let the Whimsical Lawyer Watch speak it for you. It features hand-crafted miniatures of a legal scale and mallet. Makes a great Lawyer appreciation gift. 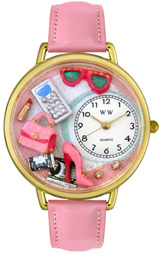 • GOLD Classic Watch Case / PINK (Padded) Watch Band: Watch case diamater is 1.5". #C-0620002. BUY NOW! • SILVER Classic Watch Case / PINK (Padded)Watch Band: Watch case diamater is 1.5". #S-0620002. BUY NOW! 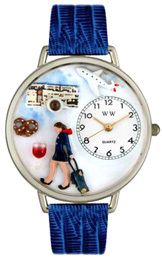 Watch Gold/Silver Style Flight Attendant UNISEX: If you can't find the right words to acknowledge your Flight Attendant, let the Whimsical Flight Attendant Watch speak it for you.Features hand-crafted miniatures of a Flight Attendant, luggage and wine glass. The perfect way to show your appreciation for your Flight Attendant. • GOLD Unisex Watch Case / ROYAL BLUE (Skin) Watch Band: Watch case diamater is 1.5". #G-0310002. BUY NOW! • SILVER Unisex Watch Case / ROYAL BLUE (Skin) Watch Band: Watch case diamater is 1.5". #U-0310002. BUY NOW! Watch Gold/Silver Style Chef UNISEX: If you can't find the right words to acknowledge your Chef, let the Whimsical Chef Watch speak it for you. 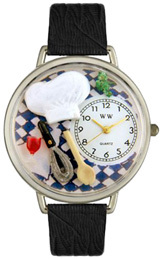 It features hand-crafted miniatures of a Chef Hat, wine and wood spoon. The ideal way to show your appreciation for your Chef. • GOLD Unisex Watch Case / BLACK (Skin) Watch Band: Watch case diamater is 1.5". #G-0310002. BUY NOW! • SILVER Unisex Watch Case / BLACK (Skin) Watch Band: Watch case diamater is 1.5". #U-0310002. BUY NOW! 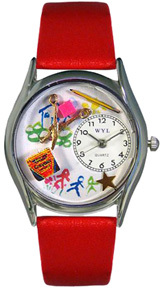 Watch Gold/Silver Style Artist UNISEX: If you can't express your acknowledgement to your Artist, let the Whimsical Artist Watch say it for you. 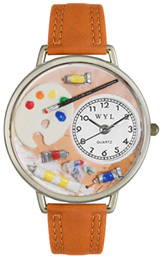 It features hand-crafted miniatures of a Art Pallet, Paint Brush, Paint rag and Paint Tubes. The perfect way to express your appreciation for your Artist. • GOLD Unisex Watch Case / TAN (Padded) Watch Band: Watch case diamater is 1.5". #G-0410002. BUY NOW! • SILVER Unisex Watch Case / TAN (Padded) Watch Band: Watch case diamater is 1.5". #U-0410002. BUY NOW! Watch Gold/Silver Style Dog Groomer UNISEX: If you can't express your recognition to your Dog Groomer, let the Whimsical Dog Groomer Watch say it for you. It showcases hand-crafted miniatures of a Poodle, clippers and perfume bottle. The perfect way to manifest your thanks for your Dog Groomer. • GOLD Unisex Watch Case / PINK (Padded) Watch Band: Watch case diamater is 1.5". #G-0630007. BUY NOW! • SILVER Unisex Watch Case / PINK (Padded) Watch Band: Watch case diamater is 1.5". #U-0630007. BUY NOW! 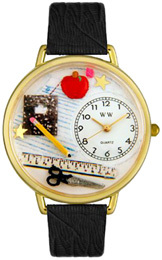 Watch Gold/Silver Style Preschool Teacher Classic: This is the smaller version of the Whimsical Preschool Teacher Watch. Features hand-crafted miniatures of a scissors and crayons. Makes a great Preschool Teacher appreciation gift. 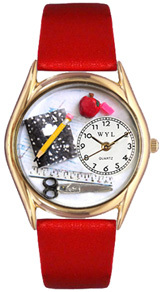 • GOLD Classic Watch Case / RED Watch Band: Watch case diamater is 1.25". #C-0640004. BUY NOW! 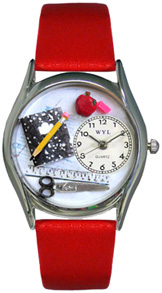 • SILVER Classic Watch Case / RED Watch Band: Watch case diamater is 1.25". #S-0640004. BUY NOW! 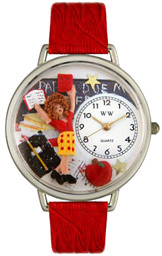 Watch Gold/Silver Style Teacher Classic: This is the smaller version of the Whimsical Preschool Teacher Watch. Features hand-crafted miniatures of a a Book, Pencil and Eraser. Makes a great Teacher appreciation gift. • GOLD Unisex Watch Case / RED Watch Band: Watch case diamater is 1.25". #C-0640002. BUY NOW! • SILVER Unisex Watch Case / RED Watch Band: Watch case diamater is 1.25". #S-0640002. BUY NOW! 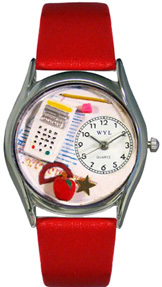 Watch Gold/Silver Style Math Teacher Classic: This is the smaller version of the Whimsical Math Teacher Watch. It features hand-crafted miniatures of a calculator and apple. Makes a great Math Teacher appreciation gift. • GOLD Unisex Watch Case / RED Watch Band: Watch case diamater is 1.25". #C-0640011. BUY NOW! • SILVER Unisex Watch Case / RED Watch Band: Watch case diamater is 1.25". #S-0640011. BUY NOW! 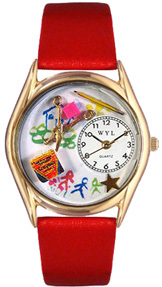 Watch Gold/Silver Style Kindergarten Teacher UNISEX: If you can't find the right words to acknowledge your Kindergarten Teacher, let the Whimsical Kindergarten Teacher Watch speak it for you. It features hand-crafted miniatures of a Teacher, book and apple. The ideal way to show your appreciation for your Kindergarten Teacher. • GOLD Unisex Watch Case / RED (Skin) Watch Band: Watch case diamater is 1.5". #G-0640002. BUY NOW! • SILVER Unisex Watch Case / RED (Skin) Watch Band: Watch case diamater is 1.5". #U-0640002. BUY NOW! Watch Gold/Silver Style Teacher UNISEX: If you can't express your recognition to your Teacher, let the Whimsical Teacher Watch say it for you. It features hand-crafted miniatures of a a note book, pencil, eraser and apple. The perfect way to express your appreciation for your Teacher. • GOLD Unisex Watch Case / BLACK (Skin) Watch Band: Watch case diamater is 1.5". #G-0640001. BUY NOW! • SILVER Unisex Watch Case / BLACK (Skin) Watch Band: Watch case diamater is 1.5". #U-0640001. BUY NOW! 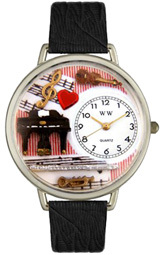 Watch Gold/Silver Style Music Teacher UNISEX: If you can't express your acknowledgement to your Music Teacher, let the Whimsical Music TeacherWatch say it for you. It features hand-crafted miniatures of a piano, violin, trumpet, and musical symbols. The ideal way to show your admiration for your Music Teacher. • GOLD Unisex Watch Case / BLACK (Skin) Watch Band: Watch case diamater is 1.5". #G-0510001. BUY NOW! • SILVER Unisex Watch Case /BLACK (Skin) Watch Band: Watch case diamater is 1.5". #U-0510001. BUY NOW! Watch Gold/Silver Style Knitting Classic: Adore knitting? Know someone who does? This Knitting-themed Whimsical Watch is the ideal gift for the knitting enthusiast in your life. With wonderful miniatures of knitting needles and real yarn, these watches are exclusive hand-crafted pieces of art. 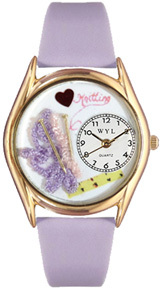 • GOLD Classic Watch Case / LAVENDER Watch Band: Watch case diamater is 1.25". #C-0440003. BUY NOW! • SILVER Classic Watch Case / LAVENDER Watch Band: Watch case diamater is 1.25". #S-0440003. BUY NOW! 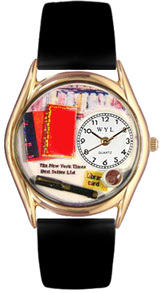 Watch Gold/Silver Style Book Lover Classic: Passion for reading? Know someone who does? This Reading-themed Whimsical Watch is the wonderful gift for the bibliophile in your life, with miniatures of books, a pen, and a cup of coffee on a background of a library. • GOLD Classic Watch Case / BLACK Watch Band: Watch case diamater is 1.25". #C-0450003. BUY NOW! • SILVER Classic Watch Case / BLACK Watch Band: Watch case diamater is 1.25". #S-0450003. BUY NOW! 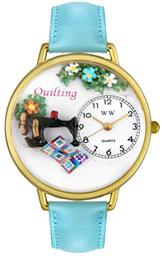 Watch Gold/Silver Style Quilting UNISEX: Passion for quilting? Know someone who does? This Quilting-themed Whimsical Watch is the perfect gift for the quilting fan in your life, with a miniature of an antique sewing machine, flowers and a little square of blanket. • GOLD Unisex Watch Case / BABY BLUE (Padded) Watch Band: Watch case diamater is 1.5". #G-0450012. BUY NOW! • SILVER Unisex Watch Case / BABY BLUE (Padded) Watch Band: Watch case diamater is 1.5". #U-0450012. BUY NOW! Watch Gold/Silver Style Knitting UNISEX: Passion for knitting? Know someone who does? 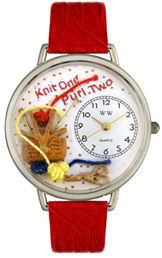 This knitting-themed Whimsical Watch is the ideal gift for the knitting enthusiast in your life. With hand-painted miniatures of a basket, real yarn balls, knitting needles, and scissors, these watches are distinct hand-crafted pieces of art. • GOLD Unisex Watch Case / RED (Skin) Watch Band: Watch case diamater is 1.5". #G-0410003. BUY NOW! • SILVER Unisex Watch Case / RED (Skin)Watch Band: Watch case diamater is 1.5". #U-0410003. BUY NOW! 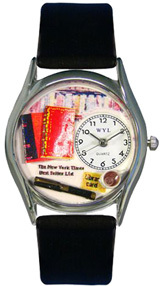 Watch Gold/Silver Style Book Lover UNISEX: Passion for reading? Know someone who does? 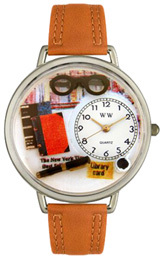 This reading-themed Whimsical Watch is the ideal gift for the bibliophile in your life, with miniatures of books, a pair of glasses, and coffee, on a backdrop of a library. • GOLD Unisex Watch Case / TAN (Padded) Watch Band: Watch case diamater is 1.5". #G-0460001. BUY NOW! • SILVER Unisex Watch Case / TAN (Padded) Watch Band: Watch case diamater is 1.5". #U-0460001. BUY NOW! Watch Gold/Silver Style Bridge Lover UNISEX: Enjoy bridge? Know someone who does? 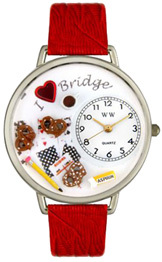 This Bridge-themed Whimsical Watch is the perfect gift for the bridge enthusiast in your life, with miniatures of coffee, pretzels, ibuprofen for those long hours playing, and a pencil, on a backdrop of cards and a score sheet. • GOLD Unisex Watch Case / RED (Skin) Watch Band: Watch case diamater is 1.5". #G-0430001. BUY NOW! • SILVER Unisex Watch Case / RED (Skin) Watch Band:Watch case diamater is 1.5". #U-0430001. BUY NOW! Watch Gold/Silver Style Scrapbook UNISEX: Enjoy arranging together scrapbooks? Know someone who does? 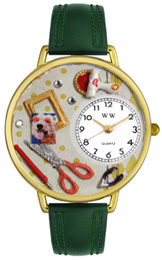 This Whimsical Watch is the perfect gift for the scrapbook enthusiast in your life, presenting hand-painted miniatures of a scrapbook, stamp, and paintbrush. • GOLD Unisex Watch Case / HUNTER GREEN Watch Band: Watch case diamater is 1.5". #G-0410008. BUY NOW! • SILVER Unisex Watch Case / HUNTER GREEN Watch Band: Watch case diamater is 1.5". #U-0410008. BUY NOW! 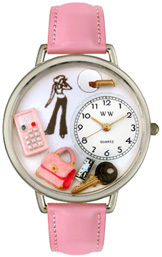 Watch Gold/Silver Style Shopper Mom UNISEX: Is your mother a distinguished Shopaholic? 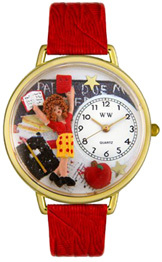 Offer her some retail therapy with this wonderful Shopper Mom Gold Watch. It's a perfect gift for any occasion - and might keep her out of the shopping arena for one day! • GOLD Unisex Watch Case / PINK (Padded) Watch Band: Watch case diamater is 1.5". #G-1010008. BUY NOW! • SILVER Unisex Watch Case / PINK (Padded) Watch Band:Watch case diamater is 1.5". #U-1010008. BUY NOW! 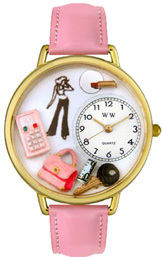 Watch Gold/Silver Style Teen Girl UNISEX: The Teen Girl themed watch showcases hand painted miniatures of a cell phone, keys, lipstick and a purse. It's the ideal gift for the Teen girl in your life. • GOLD Unisex Watch Case / PINK (Padded)Watch Band: Watch case diamater is 1.5". #G-1610008. BUY NOW! • SILVER Unisex Watch Case / PINK (Padded)Watch Band:Watch case diamater is 1.5". #U-1610008. BUY NOW! 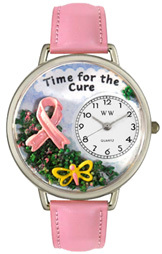 Watch Gold/Silver Style Time for the Cure UNISEX: Whether you know someone who has to combat breast cancer or you just want to support the cause the Time for the Cure Watch is the ideal way to do that. We donate 10% to fight the disease. The watch features miniatures of a pink ribbon and a butterfly. • GOLD Unisex Watch Case / PINK (Padded)Watch Band: Watch case diamater is 1.5". #G-1110001. BUY NOW! • SILVER Unisex Watch Case / PINK (Padded)Watch Band:Watch case diamater is 1.5". #U-1110001. BUY NOW! Watch Gold/Silver Style Valentine's Day UNISEX: Valentine's Day Watch is a romantic Valentine's Day gift for your extraordinary honey. 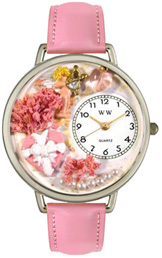 This handcrafted gift watch is made using hand-crafted miniatures of pink roses, a heart, pearls and Cupid. This watch makes a perfect gift for that exceptional someone on Valentine's Day. • GOLD Unisex Watch Case / PINK (Padded) Watch Band: Watch case diamater is 1.5". #G-1220024. BUY NOW! • SILVER Unisex Watch Case / PINK (Padded)Watch Band:Watch case diamater is 1.5". #U-1220024. BUY NOW! 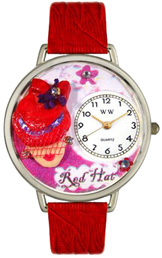 Watch Gold/Silver Style Red Hat Madam UNISEX: Is your mother or grandmother a Red Hat Lady? If so, this Red Hat Gold Watch is the perfect gift for her for any occasion! • GOLD Unisex Watch Case / RED (Skin)Watch Band: Watch case diamater is 1.5". #G-0470005. BUY NOW! • SILVER Unisex Watch Case / RED (Skin) Watch Band: Watch case diamater is 1.5". #U-0470005. BUY NOW! Watch Gold/Silver Style Lord's Prayer Classic: This meaningful Lord's Prayer Whimsical Watch is an ideal religious gift for your friends and loved ones. 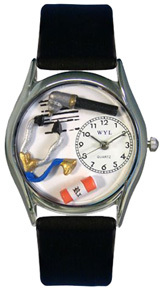 Buy this distinct Biblical gift watch for the devoted Christians on your holiday gift list. 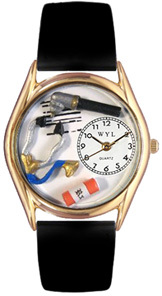 This hand-crafted watch is the perfect spiritual gift to manifest one's love of prayer. Gold/Silver watch case diameter is 1.25". • GOLD Classic Watch Case / BLACK Watch Band: Watch case diamater is 1.25". #C-0710010. BUY NOW! • SILVER Classic Watch Case / BLACK Watch Band:Watch case diamater is 1.25". #S-0710010. BUY NOW! 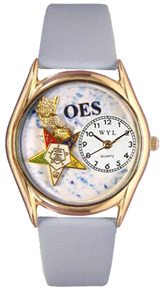 Watch Gold/Silver Style Order of the Eastern Star Classic: The Order of the Eastern Star Silver Watch is the perfect religious gift for your holiday or birthday gift list. This Whimsical Watch is a beautiful hand-crafted gold/silver timepiece with watch case diameter is 1.25". • GOLD Classic Watch Case / LIGHT BLUE Watch Band: Watch case diamater is 1.25". #C-0710008. BUY NOW! 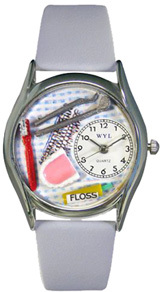 • SILVER Classic Watch Case / LIGHT BLUEWatch Band:Watch case diamater is 1.25". #S-0710008. BUY NOW! Watch Gold/Silver Style July 4th Patriotic Classic: The July 4th Patriotic Silver Watch is definite to be a memorable addition in your collection. 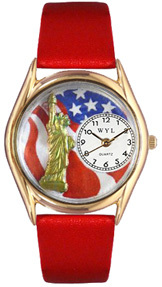 With the July 4th Patriotic Watch, you can display your patronage for America with pride. The Statue of Liberty in gold stands out against a red, white, and blue background. 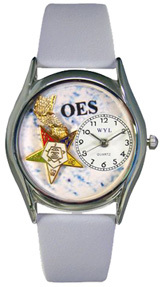 Be patriotic and get this exclusive July 4th Patriotic Watch. Gold/Silver watch case diameter is 1.25". • GOLD Classic Watch Case / BLACK Watch Band: Watch case diamater is 1.25". #C-1228001. BUY NOW! • SILVER Classic Watch Case / BLACK Watch Band: Watch case diamater is 1.25". #S-1228001. BUY NOW! Watch Gold/Silver Style July 4th Patriotic UNISEX: The July 4th Patriotic Watch is certain to be a prized addition in your collection. 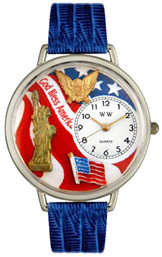 With the July 4th Patriotic Watch, you can demonstrate your support for America with pride. Details like an American flag, eagle, and the Statue of Liberty stand out against the red, white, and blue setting. 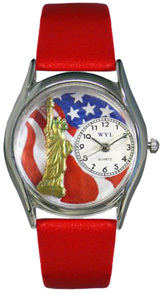 Be patriotic and get this distinct July 4th Patriotic Watch. • GOLD Unisex Watch Case / RED Watch Band: Watch case diamater is 1.5". #G-1220022. BUY NOW! • SILVER Unisex Watch Case / RED Watch Band: Watch case diamater is 1.5". #U-1220022. BUY NOW! 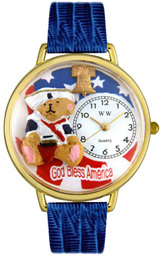 Watch Gold/Silver Style Patriotic Teddy Bear UNISEX: This sailor-suited teddy bear loves America, and isn't afraid to display it! With the hand-painted miniature Teddy Bear, miniature Liberty Bell, and a background of an American flag, this watch is a delightful declaration of American patriotism. • GOLD Unisex Watch Case / ROYAL BLUE (Skin)Watch Band: Watch case diamater is 1.5". #G-0230004. BUY NOW! • SILVER Unisex Watch Case / ROYAL BLUE (Skin)Watch Band: Watch case diamater is 1.5". #U-0230004. BUY NOW! Watch Gold/Silver Style Hummingbirds Classic: Hummingbird themed Whimsical Watch presents miniature Hummingbird feasting on some delicious nectar. Ideal for the Hummingbird lover and anyone that just enjoys the gorgeousness of a Spring Day. Gold/Silver watch case diameter is 1.25". • GOLD Classic Watch Case / RED Watch Band: Watch case diamater is 1.25". #C-1210003. BUY NOW! • SILVER Classic Watch Case / RED Watch Band: Watch case diamater is 1.25". #S-1210003. BUY NOW! Watch Gold/Silver Style Flamingo UNISEX: Pink Flamingos are familiar with all those who love Florida and the warm beach. The novelty gift watch is a delightful ornament in the hot days or summer. 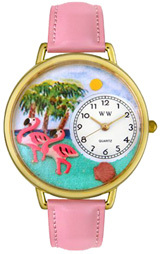 The Flamingo Watch has miniatures of two pink flamingoes in front of tropical palm trees, the ocean and a golden sun. • GOLD Unisex Watch Case / PINK (Padded) Watch Band: Watch case diamater is 1.5". #G-0150001. BUY NOW! • SILVER Unisex Watch Case / PINK (Padded) Watch Band:Watch case diamater is 1.5". #U-0150001. BUY NOW! Watch Gold/Silver Style Rooster UNISEX: The rooster is often known to crow at the break of dawn like an alarm and can be seen sitting over a high object. The Rooster themed Whimsical Watch marks this male chicken. 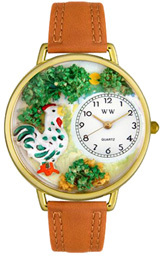 Each hand-crafted watch includes a rooster crowing beside lush greeneries. • GOLD Unisex Watch Case / TAN (Padded)Watch Band: Watch case diamater is 1.5". #G-0110001. BUY NOW! • SILVER Unisex Watch Case / TAN (Padded)Watch Band: Watch case diamater is 1.5". #U-0110001. BUY NOW! 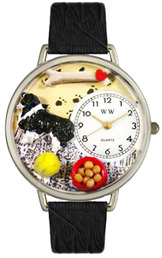 Watch Gold/Silver Style Border Collie UNISEX: The Border Collie is recognized to be the most intelligent breed of dog in respect to herding ability. 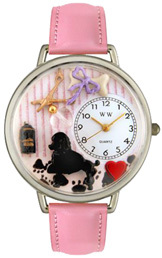 The Border Collie themed Whimsical Watch acclaims the energetic and loving breed. The watch is made of hand-crafted Miniatures of a Border Collie, a bone, a ball and a bowl of food. • GOLD Unisex Watch Case / BLACK (Skin)Watch Band: Watch case diamater is 1.5". #G-0130028. BUY NOW! • SILVER Unisex Watch Case / BLACK (Skin)Watch Band: Watch case diamater is 1.5". #U-0130028. BUY NOW! 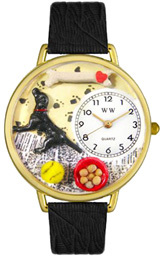 Watch Gold/Silver Style Labrador Retriever UNISEX: The Labrador Retriever is most popular breed of dog in the world. The Labrador Retriever themed Watch commends this widely-loved and talented breed. This exclusive Labrador Retriever Watch features miniature images of a Labrador Retriever, a bone, a ball and a bowl of food. • GOLD Unisex Watch Case / BLACK (Skin)Watch Band: Watch case diamater is 1.5". #G-0130011. BUY NOW! • SILVER Unisex Watch Case / BLACK (Skin)Watch Band: Watch case diamater is 1.5". #U-0130011. BUY NOW!